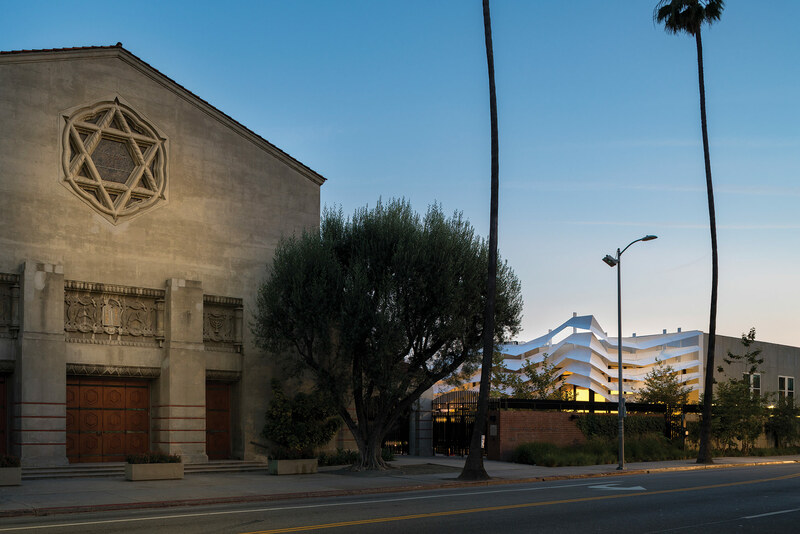 The Temple Israel of Hollywood revamp has yielded a collection of generous, sunlit spaces, including a sculptural multiuse chapel. 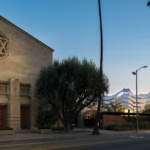 It took decades of piecemeal construction—a new day school here, a dank brick chapel there—to build the Temple Israel of Hollywood (TIOH). 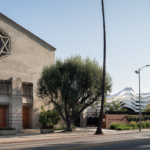 But it would require 10 years of work by Koning Eizenberg Architecture to transform the 90-year-old Spanish Colonial Revival–style temple into a flexible and social campus for worship. 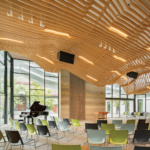 So far, the project has yielded a collection of generous, sunlit spaces, including a sculptural multiuse chapel. The chapel is a study in contrasts: A large glass wall populated by staggered, canted window panes fronts a courtyard framed by the masonry-clad temple and a low administrative wing, the glass surfaces of the new chapel sheathed by a folded-aluminum louver system. 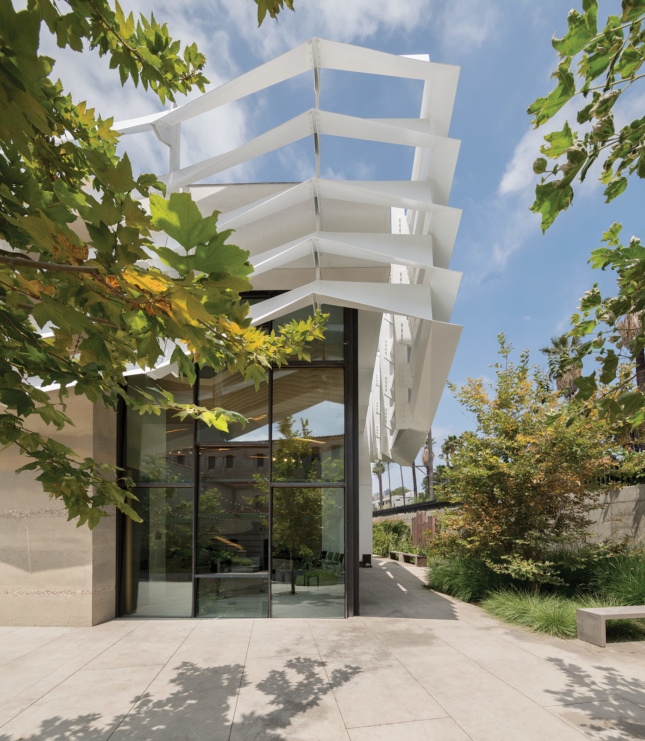 That steel-supported shade was meticulously designed and fabricated against the restrictive physical tolerances of the aluminum material—its design is partially inspired by the ceremonial tallit cloth. The expanse is interrupted by a wall enclosing the Ark of the chapel, an extra-thick volume that appears to be made of solid sandstone but is actually hollow inside. 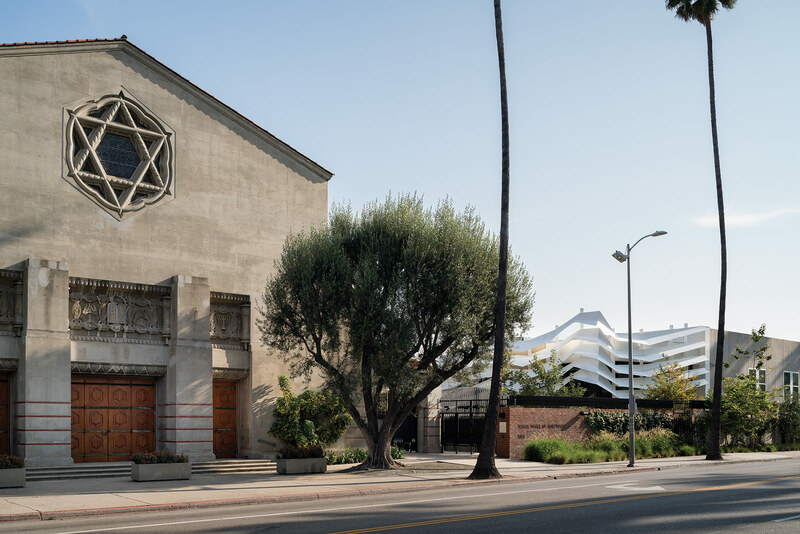 The sedimentary exterior treatment on the Ark is achieved by hand-applying compositions of different colored sands and tiny pebbles—brought to Los Angeles from congregants’ visits to Jerusalem—over a shotcrete substrate. Nathan Bishop, principal at KEA and project designer for TIOH, explained that a tight budget forced the architects to develop custom but frugal approaches. “There are no off-the-shelf products,” Bishop explained regarding the chapel’s major components. Along the inside of the chapel, the Ark itself is interrupted by a large vertical screen made of CNC-milled maple. The Ark screen is decorated by a dense geometric pattern that conceals a space containing a Torah. 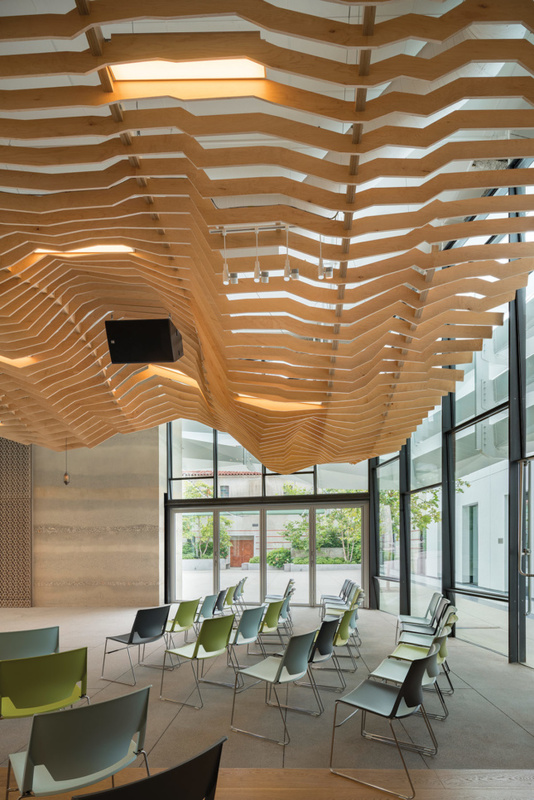 The chapel interior is topped by a suspended CNC-milled, segmented plywood ceiling. Its crisscrossing and angular profiles sweep from east to west, variable peaks and valleys rising and falling to create a cavernous lid. 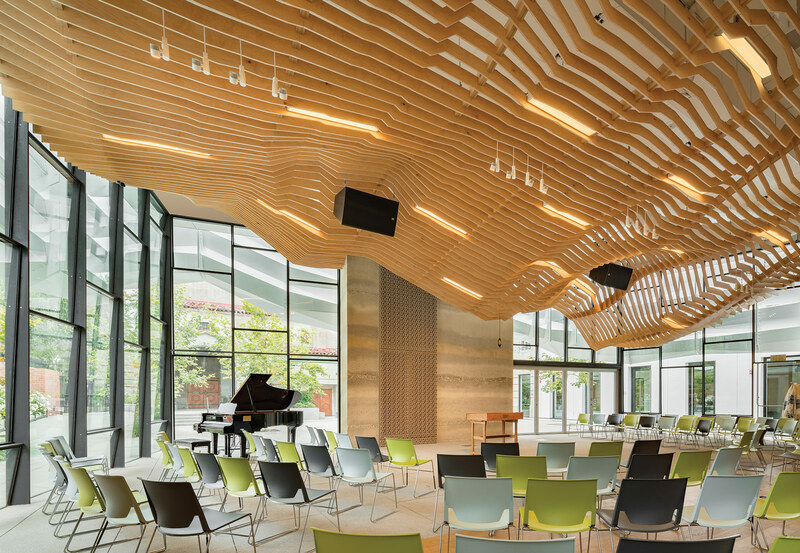 The segments allow for the ceiling to have two readings: an airy structure from below, and a solid one from afar. Bishop explained that among the Ark wall, sunshade, and chapel ceiling, the designers aimed to establish an open-ended dialogue between architecture and ritual. The sunshade, for example, can exist as a discrete architectural element reflecting light every which way, while remaining vaguely associated with “something that feels like the frayed end of the tallit,” as Bishop put it.